The ’61 Chevy Impala rolled off the production line with a few body changes that defined its look. While still built on the B-Body platform, the 1961 Impala was a touch shorter than the 1960 Impala had been. It had a different roofline, and those iconic Impala fins were shaved down into smooth, rounded tail that curved around to house a set of triple tail lights on each side of the car. The 1961 production introduced the first year for the third generation Chevy Impala. The dramatic shape of the previous year’s models had been toned down into a boxy, sleek shape. The 119-inch wheelbase left the ’61 Impala 1.5 inches shorter than the ’60 Impala, and the slightly shortened designed added to the boxy lines. 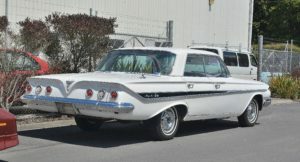 The six-taillight style in the rear was unique to the Impala, and made this a car that stood out from other Chevrolets when looking at it from behind. A total of five different engine options and five different transmission options were offered, for a variety of possible power-train combos. The six interior colors available were: Blue, Green, Turquoise, Red, Grey, and Fawn. The ’61 Impala was a wildly popular car, with a total of 491,000 produced in 1961, as noted by My Classic Garage. 79,903 of those were convertible coupes, like the Tuxedo Black Impala Shown at the top of this page. 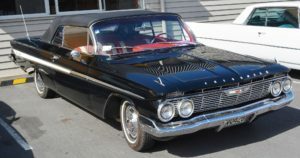 The rarest model of all was the Impala Super Sport for 1961, with only 453 produced with the Impala SS option package. Interested in Buying or Selling a Classic Chevy Impala? Part of the reason Classic Cars Online US exists is to help connect classic car buyers and sellers, and we’ve added several ways for you to connect, but first, be sure to visit the Classifieds page if you’re in the market to buy or sell classic cars such as the iconic 1961 Chevy Impala. To be the first to know about our site updates and latest offerings, sign up for the newsletter on the upper right side of this page. If you would like to connect on social media, be sure to visit and like this site’s Facebook page, the Best Classic Cars for Sale Online Facebook page or join the Classic Cars Online: Classic Cars for Sale Facebook group.